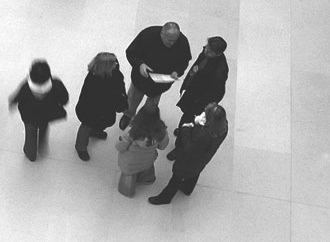 Research conducted by the ERM Initiative at NC State University in partnership with Protiviti finds that executives across all types and sizes of organizations that span a number of industries believe risks related to regulatory changes and increased regulatory scrutiny represent the greatest threat to growth opportunities for 2015, reflecting a general concern that broader government and regulatory interventions may have a significant effect on profitability. Additionally, cyber threats and privacy/identity management are a top risk concern, especially for large organizations. 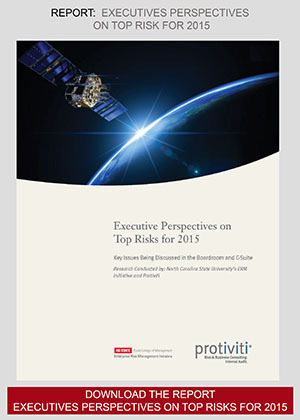 This just released report, Executive Perspectives on Top Risks for 2015, summarizes the top risks that executives and board members see on the horizon for 2015 and it provides an analysis of top risk concerns across a number of industries and sizes of organizations, and executive positions. The report is a reminder of the need to devote more resources to risk management and risk oversight given the complexities and risks within the global business environment. Executives can also compare their views about risks that are likely to affect their organizations in 2015 to the survey findings online using Protiviti’s Benchmarking Tool. 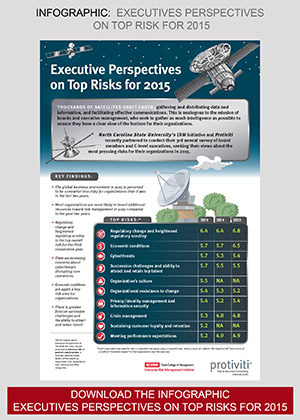 Suggestions on how to respond to these top risks. The webinar will be hosted by North Carolina State University’s Professor Mark Beasley and Protiviti’s Managing Director Jim DeLoach.